This week’s theme includes more Fourth of July picnic and party gear, pet supplies, outdoor toys and pools, and some home and garden items. 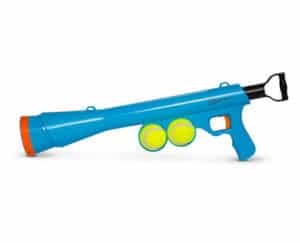 Heart to Tail Tennis Ball Launcher, $9.99. This is marketed to people who own dogs that like to play fetch. It launches balls up to 32 feet, with multiple lever positions for different distances. It comes with two balls and features hands-free storage and pickup. Ambiano Portable Ice Maker, $79.99. Makes ice in less than 10 minutes, and can make 26 lbs. of ice in 24 hours. Adventuridge Portable 42-Can Cooler with Removable Handle, $19.99. Measures 15.2″ x 17.5″ x 12″. Easy Home 6′ Fold-in-Half Bench, $24.99. Measures 72.5″ x 12″ x 17.5″. You also can purchase the Easy Home 6′ Folding Table with Wheels for $34.99. It measures 72″ x 30″ x 29″. Crane Insulated 64-Ounce Beverage Cooler, $9.99. Crofton Cut Fruit Bowl, $4.99. Crofton Floating Wine Glass, $1.99. The stem allows the glass to float upright in water. Crofton Salad Bowl with Ice Pack, $5.99. Huntington Home Vinyl Tablecloth, $2.99. Multiple designs. Choose from 52″ W x 70″ L, 60″ W x 84″ L, or 70″ R.
Crofton Melon Knife Assortment, $3.99. Assortment includes Watermelon Knife, Melon Knife, or Slicer/Corer. Summer Waves Pool, $14.99. Hexagon pool is 79.5″ x 79.5″ x 18.25″; Rectangle pool is 79.5″ x 59.5″ x 18.25″. Crane Inflatable Island Play Center, $19.99. Measures 104″ x 54″ x 27″. Includes built-in water sprayer, slide, and shade. Big Joe Mesh Pool Noodle, $12.99. Measures 48″ L x 6″ D. Made of mesh, neoprene fabric with bean filling. Crane Water Sports Balls, $6.99. Choose from Football, Volleyball, or Skipper Balls. Skipper Balls jump and skip across the water. Crane Novelty Pool Float, $3.99. Choose from Pink Doughnut, Poop, Pizza, or Rainbow Popsicle. Water Slide Assortment, $12.99. Choose between Obstacle Course or Baseball. Huntington Home Round Beach Towel, $16.99. Measures 60″ in diameter. Scoot Board, $14.99. Weight capacity is 110 lb. Wheels swivel 360 degrees. Choose from Paw Patrol, Flames, or Chevron. Baden Glow in the Dark Sports Balls, $7.99. Choose from Basketball, Football, or Soccer Ball. Glows for 30 minutes after 10 minutes of light exposure. Grafix Sidewalk Chalk Activity Tub, $7.99. Heart to Tail Car Protection Cover, $9.99. Heart to Tail Pet Auto Waterer, $8.99. Holds up to 1.6 gallons of water. Heart to Tail Pet Cooling Mat, $9.99. Measures 24″ W x 30″ L. Stays 5-10 degrees cooler than room temperature. Heart to Tail Pet Leash or Dog Harness, $5.99. Heart to Tail Padded Dog Collar, $3.99. Heart to Tail Retractable Dog Leash, $6.99. Heart to Tail Pet Travel Accessories, $6.99. Choose between Travel Bottle With Bowl or Elevated Collapsible Feeder. Heart to Tail Pet Waste Bags and Dispenser Assortment, $2.99. Heart to Tail Roll Up Pet Travel Bed, $12.99. Easy Home 16″ Pedestal Fan, $16.99. Crofton Metal Dessert Bakeware, $4.99. Choose from 6-Cavity Jumbo Muffin Pan, 6-Cavity Donut Pan, 12-Cavity Dessert Bar Pan, or 8 Cavity Mini Loaf Pan. Huntington Home 7.25-Ounce Aromabeads Candle Assortment, $3.49. Choose from Sparkling Citrus Zest, South Seas, Fresh Berries, or Coconut Mango. Gardenline Bee and Insect House, $9.99. Assorted varieties. Gardenline Bamboo Torch, $2.69. You also can purchase Gardenline Torch Fuel for $3.99. Gardenline Tabletop Torch, $7.99. Choose from Flower or Pineapple designs. Uses citronella fuel and burns up to eight hours. Gardenline Triple Wick Citronella Candle, $5.99. Gardenline Magnetic Fly Screen, $6.99. Includes 10 pieces of 2.4″ and 10 pieces of 8″ hook and loop strips, and 20 pieces of 0.5″ tacks for wood. Features 18 powerful magnets—easily opens, automatically closes. Installs in seconds with no tools required. Use with single doors, sliding doors, RVs, and more. Family Pack Thin Sliced Boneless Pork Chops, see price in store. Adventuridge, Ambiano, Baden, Crane, Crofton, Easy Home, Gardenline, Grafix, Heart to Tail, Huntington Home, Summer Waves. Bookmark.